The invention of the doubling die, often called the cube, revived international interest in what was already a good game by adding a whole new dimension to the excitement. It is easy to see how a backgammon game which has started at a relatively low stake can suddenly become a much more serious affair, as the cube escalates to 8, 16 or even 32, with the possibility that the winner will, in the end, win a gammon or even a backgammon. But that is not all. 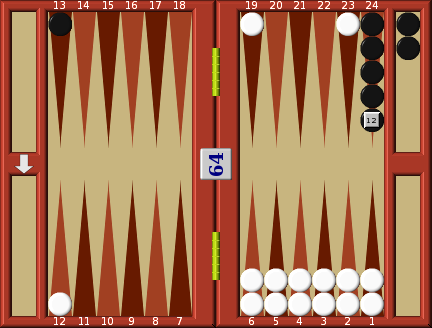 Doubling has not only added excitement to the backgammon game: it has also added a new element of decision. Decisions about the cube are as important as all the other skills of the game combined. Your first feeling may be that you should refuse a double whenever you are at a disadvantage. That is quite wrong, but it is an easy mistake to make	until you have thought it out. Why on earth should you agree to increase the stakes when the other person has an advantage? The answer, of course, is that you should not agree if you can keep the stakes the same. But you can't. You have either got to pay the original stake, i.e. 'drop' the double, or agree to pay for twice as much. You must choose the lesser evil. The question each time is this: 'Is it better to sacrifice the present stake by dropping, or is it worth taking the risk of agreeing to double the stakes because I still have a reasonable chance?' For the moment, I am only dealing with positions where there is no question of a gammon. Let's consider a simple example. We will assume that both sides are bearing off and you (White) judge that you have the worst of the situation, but that you have about one chance in three of winning the game. Black now offers you a double. The easiest way to look at the problem is to think what would happen if you played the game three times and got the average result, i.e. winning once and losing twice. If you refused the double (from, say, 1€ to 2€), you would lose 1€ on each game, which is 3€ in in three games. If you accepted the double, the stake would be 2€. You lose two games at 2€ each (4€ on the two games), and you win one game at 2€. So altogether you would be £2 down. That is better than the loss of 3€ which resulted from refusing the doubles. 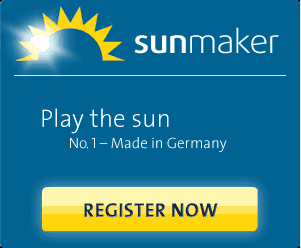 Put another way, you lose an average of 0.67€ per game if you accept the double, as opposed to 1€ if you don't. So obviously it is better to accept	a double in that position, you lose less in the long run. So the next question is 'How bad does the position have to be before it is not worth accepting the double?' The borderline case, where in the long run it will make no difference whether you accept or refuse doubles, is where, after accepting the double, you have just one chance in four of winning. Work it out for yourself. If you play four games and refuse the double each time, you lose 4€. If you accept the double each time, you will lose three games at 2€, which is 6€, and win one game at 2€, for a net loss of 4€, the same as the net loss you incurred when you refused all the doubles. Either way you lose 1€ per game on average. So the conclusion is that, when there is no question of a gammon, you should accept all doubles where you will have a better than one in four chance of winning, and refuse all doubles where your chances will be worse than that. You are probably thinking 'That's all very well, but how on earth do I know whether my chances are better or worse than one in four?' There are some	situations, especially towards the end of the game, when you are bearing off, where it is quite easy to calculate your chances. But there are many more	situations where the possibilities are far too numerous and complicated to calculate the position, and you will have to rely on your experience, or, if you can get them to tell you, the experience of experts. I am going to start by giving you one position where you can easily calculate your chances, and another where it's easy to get a pretty good idea. In Diagram, you (White) have only two men left, bearing off, and they both are on your one point. So you will definitely be off on your next shot. Black	has two men left, one on his three point, and one on his two point. It is his turn and he offers you a double. You can see that, if he throws a 1, he will fail to get off both his men and you will win. If he gets any throw that does not contain a 1 he will win. This is a very common position. Black, if he knows anything about the game, will offer you a double. If you remember what I have explained, you will accept. The reasoning is simple. Of the 36 throws Black can get, 11 will contain a 1 and win the game for you. So you will win 11 times out of 36 on average. That is better than one in	four. Therefore you must accept the double. Obviously you are going to lose much more often than you win, but it will pay in the long run. The stake should make absolutely no difference to your decision. Nor should it matter whether the cube goes from 1 to 2, or 16 to 32. 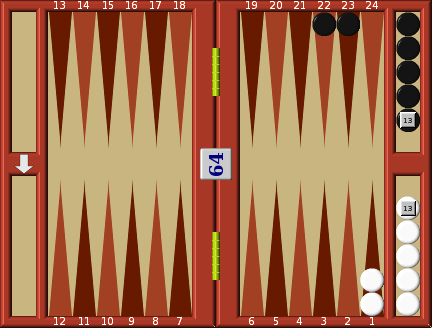 This is commonly known in Backgammon as a 'must give, must take' situation. It appears illogical at first that on the one hand you are told to give a double, and on the other to	accept it, but the mathematics are clear cut. You must bear in mind that, if you drop the double, you lose the present stake anyway, so that if you	accept from 1€ to 2€ and win at the increased stake you are better off by 3€ than if you had dropped. Black maximizes his winnings by doubling; you	minimize your loss by accepting. Now let's look at another position. In Diagram you (White) have a closed board but you have no real chance of winning the game unless you can hit one of Black's men. He is virtually certain to win in a straight runner. However, he has to get the man on his twelve point past your men on his two and six points. He doubles. If you had an hour or so and a pencil and paper, and if you were that way inclined, you could reach an approximation to your precise chances of winning. But there is no chance for a calculation of that kind at the table. So let's see roughly what the position is. Your instinct is that you are likely to get one shot. That instinct is about right. If Black gets double 6, double 5, double 4, double 3 or 6-5 (6 throws out of 36), you won't get a shot at all. Any other throw by him gives you a shot and, relatively often, it will be a double shot. Sometimes you will get a second shot after missing the first because he still won't be past you. If you get any direct shot you have a considerably better than three to one against chance of	winning, so it looks as if you should take. An exact calculation shows that that is right. In fact, in situations like this, when Black has no choice but to move his blot whatever he throws, you should accept, even if you only have one man threatening his blot, if that man is nine or more pips away from the blot. But be careful of one thing in similar situations. In a position in which you expect to have only one shot to save the game, work out whether	you are sure to win if you do hit it. If not, it is not worth accepting a double for one shot. But in this case there is no doubt about it. If Black's man is hit, he will certainly be unable to accept the redouble which you will at once offer him. With only two men borne off, his chances of winning are worse than one in four.